The word “virus” strikes terror into the hearts of most people. It conjures up images of influenza, HIV, Yellow Fever, or Ebola. Of course we worry about these viruses—they bring us disease and sometimes an excruciatingly painful death. But the 21 viral types that wreak havoc with the human body represent an insignificant fraction of the 100 million viral types on earth. Most viruses are actually vital to our very existence. No-one seems to stick up for the good guys that keep ecosystems diverse and balanced (although I did recently in a TEDx talk in Noosa). The sheer number of these good viruses is astonishing. Their concentration in a productive lake or river is often 100 million per millilitre – that’s more than four times the population of Australia squeezed into a ¼ of a teaspoon of water. Globally the oceans contain 1030 viruses. If you lined them all up they would extend for 10 million light years, or 100 times the distance across our galaxy. Collectively they would weigh as much as 75 million blue whales. In short, there are a lot. Viruses are not living organisms. They are simply bits of genetic material (DNA or RNA) covered in protein, that behave like parasites. They attach to their target cell (the host), inject their genetic material, and replicate themselves using the host cells’ metabolic pathways, as you can see in the figure below. 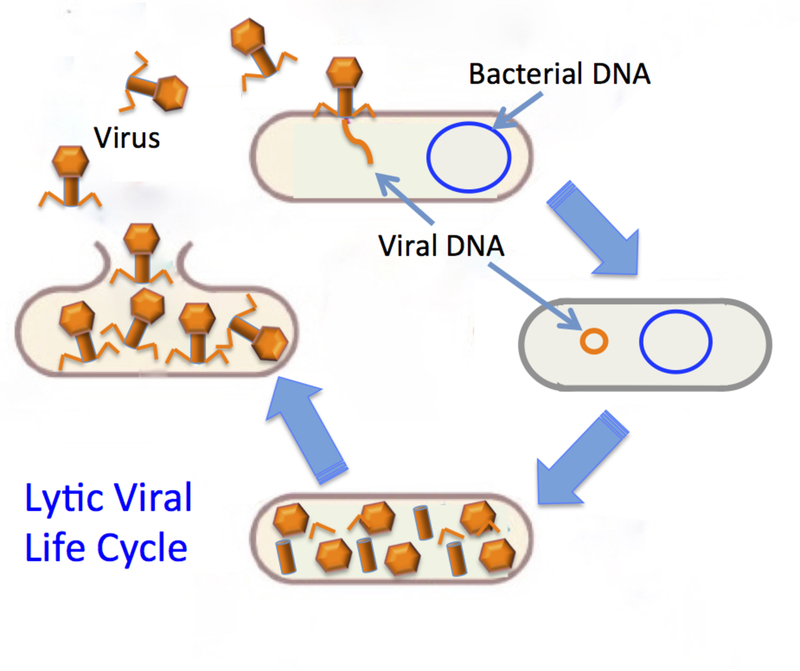 Then the new viruses break out of the cell — the cell explodes (lyses), releasing hundreds of viruses. Viruses are very picky about who they will infect. Each viral type has evolved to infect only one host species. Viruses that infect bacteria dominate our world. A virus that infects one species of bacteria won’t infect another bacterial species, and definitely can’t infect you. We have our own suite of a couple of dozen viral types that cause us disease and death. Algae and plants are primary producers, the foundation of the world’s ecosystems. Using sunlight they turn raw elements like carbon dioxide, nitrogen and phosphorus into organic matter. In turn, they are eaten by herbivores, which are in turn eaten by other animals, and so on. Energy and nutrients are passed on up the food chain until animals die. But what ensures that the primary producers get the raw elements they need to get started? The answer hinges on the viruses&apos; relationship with bacteria. A virus doesn’t go hunting for its prey. It relies on randomly encountering a host — it’s a numbers game. When the host, such as a bacterial cell, grows rapidly, that number increases. The more of a bacterial species there is, the more likely it will come into contact with its viral nemesis — “killing the winner”. This means that no single bacterial species dominates an ecosystem for very long. In freshwater, for example, you see very high rates of bacterial growth. You would think this high bacterial production would become part of the food chain and end up as fish food. But that is rarely the case. We now realise that the bacteria actually disappear from these ecosystems. So where do the bacteria go? The answer lies in the interaction of the bacteria and viruses. When a virus bursts open a bacterial cell its “guts” are spewed back into the water along with all the new viruses. The cell contents then become food for the neighbouring bacteria, thereby stimulating their growth. These bacteria increase in numbers and upon coming into contact with their viral nemesis they, too, become infected and lyse. This process of viral infection, lysis, and nutrient release occurs over and over again. Bacteria are, in effect, cannibalising each other with the help of their associated viruses. Very quickly, the elements that support the food web are put back into circulation with the help of viruses, as you can see in the graphic below. This interaction ensures inorganic nutrients are readily available to algae and plants on which ecosystems depend. It’s the combination of high bacterial growth and viral infection that keeps ecosystems functioning. This explains why we don’t see bacteria in food webs. Viruses short circuit bacterial production passing higher up the food chain so it doesn’t become fish food in freshwater ecosystems. Most of the food (dissolved organic carbon) that drives the very high bacterial growth in freshwater comes from the terrestrial environment. Indeed, freshwater viral/bacterial interactions appear to be a critical link in carbon cycle between the land and atmosphere. Soil viral ecology studies lag way behind water research. Viral dynamics in terrestrial ecosystems are complicated as soils can bind and inactivate viruses to limit their ability to infect other organisms. We may well be relying on freshwater processes to complete the global carbon cycle, as shown in the graphic above. 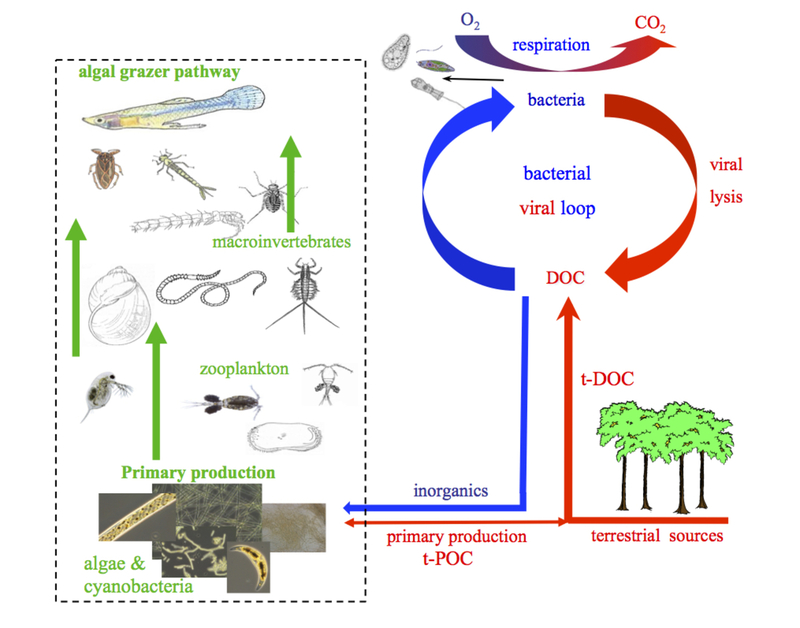 In freshwater, viruses are enhancing the rate of bacterial decomposition whereby complex organic matter is quickly and efficiently mineralised into their simple inorganic components such as carbon dioxide, nitrogen, and phosphorus. Thus viruses are a critical part of inorganic nutrient recycling. So while they are tiny and seem insignificant, viruses actually play an essential global role in the recycling of nutrients through food webs. We are only just now beginning to appreciate the extent of their positive impact on our survival. One thing is for sure, viruses are our smallest unsung heroes.